One of the first known settlers at Sarcoxie was Chief Sarcoxie, head of the Turtle Band of the Delaware Tribe. Historians have translated Sarcoxie's name as meaning "As Tall As He Is". This is said to mean he was high up in tribal government, but photos reveal that he also looked "tall". The first permanent settler to Jasper County in 1831 was Thackery Vivion from Kentucky, who located near Sarcoxie Spring and built a mill of logs on Center Creek a quarter mile east of the present town square. Platted in 1840, Sarcoxie is the oldest town in Jasper County and the only town in the United States with that name. Sarcoxie was considered a hot point during the Civil War. The first Confederate Flag, the "Star and Bars," was flown in Missouri on the Sarcoxie Square. Legend has it that the 100-foot wide flag flew from a 100-foot flag pole and was guarded closely for weeks. Following the war years, Sarcoxie became a major cowtown as a stopping point where Texas cowboys moved their herds north to the railhead at Sedalia during the 1890s. The first electric lights in Southwest Missouri appeared in 1887 at the mill where J.J. Sprague invented a dynamo and sent an order to Edison for ten incandescent bulbs. In the heart of town you will find the Square, where Sarcoxie's retail area began. 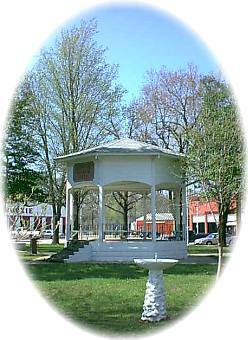 Still a congregating place, the centerpiece of the Square is the 1931 gazebo and park where monuments commemorate the town's proud past. Nickorbob's Craft Mall is one of the largest in Missouri with crafts from local artisans and a tea room. Cimarron Antique Mall features an extensive Native American Museum within it's heart, as well as a tremendous collection of horse-drawn farm equipment. Located just west of the Square, Cave Springs is the home of the Ozark Cave Fish, an endangered species found in no other location on the earth. Sarcoxie has many recreational opportunities. It is within easy access of Table Rock Lake, Grand Lake, Stockton Lake, Lake of the Ozarks, and Beaver Lake, as well as being situated on Center Creek and within a few miles of Spring River. These all offer great fishing, boating, swimming, etc. Center Creek Recreation and Golf Club and The Royalty Arena provided sporting activities and the WAC RV Park offers accommodations as well as swimming, miniature golf, and picnicking. A nine-hole, public golf course at the Center Creek Recreation and Golf Club offers year round activity. Green fees are very reasonable. Rental carts are available. Ozark Village is one of the most complete gift and souvenir shops in the area with steer horns, moccasins, fireworks, postcards, and so much more ... all under the same roof! There's something for everyone! Gasoline is also available.